NOW HE’S GOT HIS OWN CONTROLLER! BLAST BACK IN TIME WITH THE BELOVED BLUE BOMBER! DESIGNED TO BE EASY TO HOLD AND USE, THIS CONTROLLER WAS SPECIALLY CREATED WITH THE TRUE FAN IN MIND, FEATURING A TRANSPARENT COLOR DESIGN AND SPECIAL CHARACTER ART ON THE CONTROLLER. 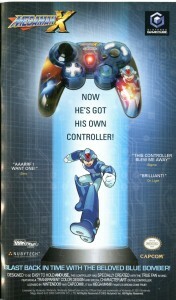 LICENSED BY NINTENDO® AND CAPCOM®, IT IS A MEGA MAN® FANATIC’S DREAM COME TRUE! I have this controller. It’s not bad. A bit smaller and sleeker than the standard GCN controller. Dual Z buttons are nice, but all the shoulder buttons seem to stick a little. I’ve heard it is supposed to light up, but I don’t believe mine ever has. Maybe that was a concept idea they later dropped, along with the PS2 version. I don’t really have any insight that hasn’t been given by other reviewers many times since 2006, so… That’s all. I wanted to purchase that controller when it was released, but I never saw it anywhere. I probably still have it written down on one of my old wishlists… It looks nice. I honestly don’t remember where I got it. Maybe I ordered it off the internet. If Zero existed, a whole bunch of people at a certain ad agency would have been cut down before this ad even hit the magazines. Okay, he probably wouldn’t *kill* them, but they’d be really, really hurt. -Guy #1: Who is Zero? -Guy #2: Is Mega Man’s best friend. -Guy #1: Ahhh, the dog.